Pregnancy can be full of contradictions and confusion, and when it comes to what to eat, there is no limit: “Don’t eat lamb because it will give the baby seizures.” “Eat a lot of red meat because you need the protein and iron.” “Avoid nuts because they may cause allergies in the baby.” “Eat nuts, especially peanuts, because it will help the baby develop a tolerance.” “Avoid pumpkin, bananas, and papaya.” “Eat a lot of fruits and vegetables.” “Don’t eat cheese or drink milk.” “Eat and drink a lot of dairy because it has calcium, which is good for the baby’s bones.” OK, so you get my point. I could go on, but instead, I am going to talk to you about what is important to know about your diet during pregnancy, myths about pregnancy foods, and how to encourage healthy eating while you are pregnant. Regardless of what stage you’re at in your pregnancy, you can always take a closer look at what is going into your body and how it could be contributing to your baby. The important thing to remember is that you want to eat a balanced diet. It doesn’t matter if you eat meat or have certain allergies or food restrictions, and it doesn’t matter if you are vegan or vegetarian. You must make sure you are getting a good variety of protein (whether from plants, nuts, dairy, fish, or meat), carbohydrates, and fruits and vegetables. Dieting is a big no-no during pregnancy. You want your baby to have full-fat foods and plenty of calories to grow big and strong. Limiting your food intake will just make you and your baby sick. I’m not saying to sit with a tub of ice cream and cookies all day. You need to remember the first rule: eat a balanced diet. If you don’t eat dairy, you will need 1,000 milligrams of calcium daily to support your pregnancy. Don’t eat meat? Find other protein sources that equal out to 27 milligrams per day. Bread and grains should be whole grain, and stay away from white foods, such as sugar, potatoes, white rice, and white bread, as much as possible. Healthy substitutes can be sweet potatoes, brown rice, and whole-grain breads. Beans are full of protein and folic acid. Add them to your diet as much as possible. You should be taking a prenatal vitamin every day to support your growing baby. The vitamin should include at least 70 milligrams of vitamin C and folic acid. There is a lot of confusion regarding how much to eat. The mainstream number is currently 300 extra calories per day for someone in good health and of average weight. Check with your doctor about a specific caloric guide. If necessary, see a nutritionist to help you put together a meal plan or calorie sheet. You can easily consume 300 calories in two small snacks. Healthy ideas include hummus and vegetables, fruit and yogurt, nuts, cheese and crackers, etc. When shopping for groceries, always eat before you head to the store; otherwise, you are bound to make poor choices, and stick to the outside aisles at the store. Your cart should be filled with mostly fresh food, so stay away from processed food as much as possible. Reading labels is very helpful and will give you a much better idea of what you are eating. You want to stay away from giving your baby too many chemicals and fast food. Morning sickness, cravings, and food aversions play a big part in pregnancy. If you are having trouble eating or sticking to a healthy diet, talk to your OB-GYN about alternatives and more serious concerns, including diabetes and hyperemesis gravidarum (uncontrollable vomiting during pregnancy). What should you avoid? The most important foods to avoid are those that may not be fresh or are improperly washed. This can include precut fruit and vegetables. If you are going to order or prepare a salad or fruit, make sure everything is washed very carefully. If ordering out, stick to restaurants with an A rating or better. If you have a choice when on the go, opt for a whole fruit instead of, for example, sliced mango from the street vendor. What about raw fish and meat? The National Health Service in England confirms eating sushi during pregnancy is safe. You will need to make sure the fish has been frozen first. You can find this out by calling ahead to your restaurant of choice. There are types of fish you should avoid during pregnancy, which include any fish high in mercury, such as tuna, tilefish, swordfish, shark, and mackerel. Avoid all raw shellfish, raw eggs, and raw meat during pregnancy because of the high risk of food contamination. Should you avoid all alcohol during pregnancy? Recent studies have shown that there is no evidence to prove drinking occasionally is hazardous to a fetus. In many countries, it is common to see a pregnant woman having a glass of wine or a beer, but in North America, our guidelines and attitudes have been much more conservative. “Fetal alcohol syndrome” was coined in 1973 to describe various abnormalities, such as small eyes, slow growth, cleft palates, and severe cognitive disabilities, in babies born to alcoholic mothers. It was proclaimed unsafe for pregnant women to consume even one drop of alcohol. Current studies conclude that children born to light drinkers fared better on cognitive-development tests. Not drinking any alcohol is the safest choice, though current thinking is that a glass of wine or pint of beer a few times during your pregnancy won’t hurt the baby, especially after the first trimester. What is wrong with cheese and dairy? The goal is not to avoid dairy completely; it is the added risk of bacteria from raw dairy—mold-ripened cheeses, such as Brie and Camembert, and soft blue cheeses, such as Gorgonzola and Roquefort—that pregnant moms need to be aware of. Go ahead and eat yogurt, mac and cheese, your favorite Mexican food, and ice cream. Our families come from a long history of tradition. Typically included in these traditions are warnings about food during illness and pregnancy. Unless it has been backed up by a medical professional, you should be free to eat foods that are cooked, fruits, vegetables, and more. It’s best to stick to the basics and know exactly what you are eating and use your head when making decisions about what types of food to eat and how much to consume. If you know that it could cause a problem for you, it is not safe for your baby. An extra bowl of ice cream or the 3:00 a.m. slice of pizza won’t give you more than some heartburn and possible indigestion. Eating extreme amounts of processed food, sugar, and/or fast food won’t likely be a good choice for you and your growing baby. When deciding to eat raw fish, stick to the best restaurants, stay away from takeout sushi, and ask questions. If you are inclined to have a glass of wine or beer, keep it minimal and wait till after the first trimester. If you have any worry at all, it’s easier to just order a club soda. Eat a balanced diet, and enjoy your pregnancy by putting the best food into your body to provide your baby with the most nutrients and vitamins possible. Keep the old wives’ tales as just that—tales—and trust that you and your doctor know your body best. When in doubt, consult your OB-GYN or midwife for the most accurate and up-to-date information on pregnancy health and nutrition. If you are concerned about any of the guidance you are receiving, make an appointment with a nutritionist or consult a second OB-GYN for an additional opinion. 1. Papaya and pineapple won’t cause miscarriages. 2. Eating saffron doesn’t make the baby’s skin fairer. 3. Eating for two during pregnancy is a bit of an exaggeration. 4. Sour foods won’t cause a pregnant woman to catch a flu or cold. 5. If you eat nuts, it won’t cause your baby to be allergic to them. 6. Limiting diet sodas, sweets, and candy while pregnant is probably wise. Enjoy your pregnancy, and have fun with your food by cooking your favorite recipes. For some additional flavor and excitement, branch out and try new, exciting dishes from around the world. 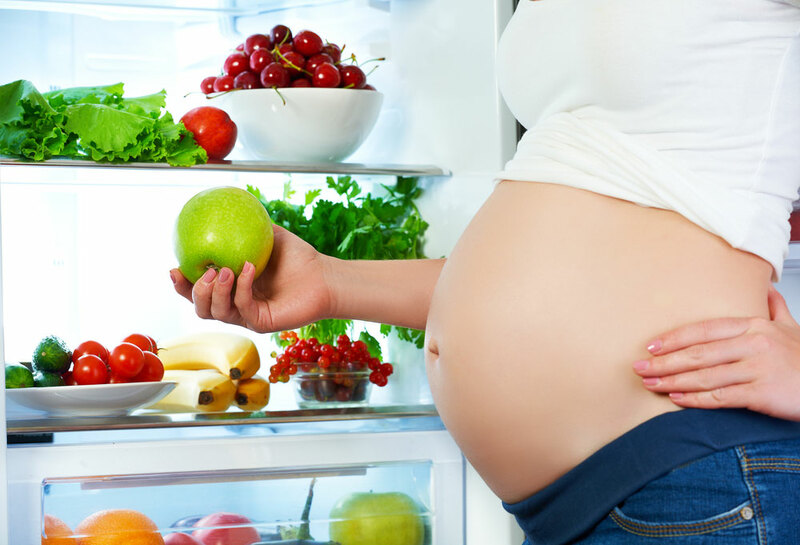 What are your favorite pregnancy foods and recipes that you love to cook? Share with us your healthy tips for delicious meals and snacks. Check out our closed Facebook group ESME Pregnancy and, if need be, Sisters Only for Postpartum Depression. If you have any questions concerning diet or depression, ask a medical professional.